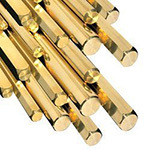 We carry a complete stock of bearing bronze, aluminum bronze, yellow brass, manganese bronze, and cast iron in solid round, tube and rectangle forms. Whether you want 1″ or a full bar we can accommodate your every need! Here, you’ll find an incredibly massive selection of bar stock that boasts a diverse variety of bronze, brass, and copper alloys. It’s not often that you find an all-in-one foundry, machine shop, and full bar stock warehouse in a single company -but that’s just the advantage in choosing Montclair Bronze. So, if you’re in need of non-ferrous bar stock, then chances are, you’ll find it here in our warehouse. Montclair Bronze’s mission is to provide you with the simplest supply solutions that result in lower costs and seamless logistics, because that’s what our clients depend on. Feel free to browse our catalog of metal bar stock products below, and if you have any additional questions or you’d like to get a quote before placing a bulk order, then be sure to visit our convenient Request a Quote page to complete the online form.